The development of the Garden City, once teeming with walkers who leisurely ambled down the wide pavements in the evenings, has turned the simple act of crossing the road into a gamble. And it’s a gamble that all pedestrians have to take, and one that thousands lose, often with fatal results. 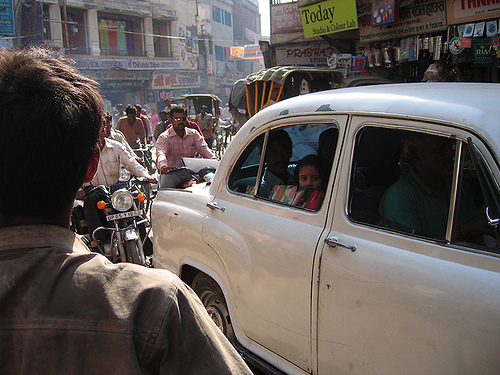 In 2007, 120,000 people died in car accidents in India, and that number is expected to grow by 5% each year. Crossing a street like this one in Bangalore is not an easy task. The BBMP [the Bangalore government], in its enthusiasm to provide motorists with hassle-free rides, has let pedestrian safety fall by the wayside. Flyovers, underpasses and one-ways have squeezed pedestrians out of the roads. Major infrastructure projects either eat up footpaths or shrink them so much that they are practically useless. Right now, India is standing at a crossroads: it can either create its cities for cars or for people. With skyrocketing energy demand, deteriorating air quality, and horrible gridlock the path it should take is clear.